HONOLULU, Hawaii, September 4, 2106 (ENS) – “Our planet is most certainly at a crossroads,” declared Zhang Xinsheng, president of the International Union for the Conservation of Nature, Thursday at the opening ceremony of the IUCN World Conservation Congress. “This unique gathering of top minds holds the key to innovation, inspiration and most importantly, action,” he told delegates from 192 countries gathered in Honolulu for the triennial event, the first ever held in the United States. A report released at the conference today indicates that many of the world’s gorillas may not be here tomorrow. The Eastern lowland gorilla, called Grauer’s gorilla, Gorilla beringei graueri, is newly listed as Critically Endangered due to illegal hunting for bushmeat, according to the latest update of the IUCN Red List of Threatened Species. Hunting has made the Grauer’s gorilla population plummet by 77 percent since 1994, falling from 16,900 individuals to just 3,800 in 2015. 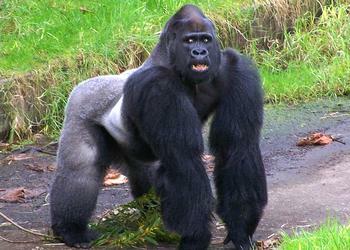 Gorillas are divided into two species – Eastern and Western – each with two subspecies. The Eastern gorillas include the subspecies Eastern lowland gorilla, Gorilla beringei graueri, and Mountain gorilla, Gorilla beringei beringei. The Western gorillas include the subspecies Western lowland gorilla, Gorilla gorilla gorilla, and the Cross River gorilla, Gorilla gorilla diehli. Both species and all four subspecies are now listed as Critically Endangered on the IUCN’s Red List of Threatened Species. “To see the Eastern gorilla, one of our closest cousins, slide towards extinction is truly distressing,” said Inger Andersen, IUCN director general. The new designation for the world’s largest living primate follows a report earlier this year by the Wildlife Conservation Society, WCS, and Fauna & Flora International, FFI, showing the collapse of Grauer’s gorilla numbers due to illegal hunting and civil unrest. Few Grauer’s gorillas exist in captivity and if this ape becomes extinct in the wild it will be lost forever, warns Plumptre. The WCS and FFI surveys documented that Grauer’s gorilla has declined by at least 77 percent over the past 20 years using three methods of estimation. Other methods estimated up to a 94 percent decline at specific sites where they have been monitored over time. A decline of 80 percent over the time span of three generations leads to a listing of Critically Endangered status. Twenty years is considered to be the duration of one generation for these gorillas, as they are a long-lived ape. The scientists who surveyed the Grauer’s gorilla population say the main cause of the decline is hunting for bushmeat, which is taking place around villages and mining camps established by armed groups deep in the forests in eastern DR Congo. The mines are set up in remote areas to provide the financing for weapons to continue the armed struggle by these groups. Being deep in the forest to avoid detection, they are also in the areas where gorillas have tended to survive because of the remoteness and distance from villages and roads. 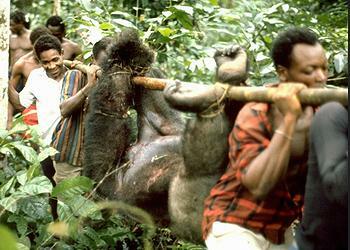 There is no agriculture in these sites, so the miners/rebels can only subsist off bushmeat. Gorillas provide more meat than most species per shotgun cartridge and can be tracked easily because they are mainly terrestrial and move in a group, making them vulnerable to hunting. Only one site, the highland sector of Kahuzi-Biega National Park, has shown an increase in gorilla numbers over the past 15 years and only where resources have been invested to protect these apes from hunting. These results have just been accepted for publication in “PLoS One,” an open source and peer reviewed scientific journal. Today’s IUCN Red List update also reports the decline of the Plains Zebra, Equus quagga, due to illegal hunting. 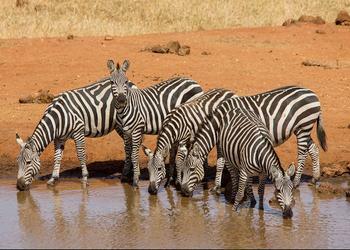 The once widespread and abundant Plains Zebra has moved from a listing of Least Concern to Near Threatened. The population has reduced by 24 percent in the past 14 years from around 660,000 to a current estimate of just over 500,000 animals. In many countries Plains Zebra are only found in protected areas, yet population reductions have been recorded in 10 out of the 17 range states since 1992. The Plains Zebra is threatened by hunting for bushmeat and skins, especially when they move out of protected areas. Three species of antelope found in Africa – Bay Duiker, Cephalophus dorsalis, White-bellied Duiker, Cephalophus leucogaster, and Yellow-backed Duiker, Cephalophus silvicultor, – also have been moved from a listing of Least Concern to Near Threatened. While the populations of these species within protected areas are relatively stable, those found in other areas are decreasing due to continued illegal hunting and habitat loss. 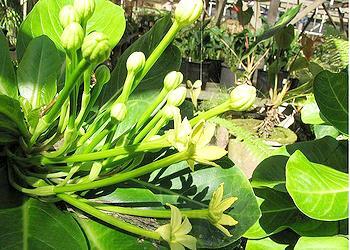 The IUCN warns of the growing extinction threat to Hawaiian plants posed by invasive species. Thirty-eight of the 415 endemic Hawaiian plant species assessed for this update are listed as Extinct and four other species have been listed as Extinct in the Wild, meaning they only occur in cultivation. Invasive species such as pigs, goats, rats, slugs, and non-native plants are destroying the native plants of Hawaii. The latest results show that of the 415 endemic Hawaiian plant species assessed so far for the IUCN Red List – out of about 1,093 plant species endemic to Hawaii – 87 percent are threatened with extinction. Now listed as Endangered is the ‘Ohe kiko’ola, Polyscias waimeae, a beautiful flowering tree found only on the island of Kauai. The Critically Endangered flowering Haha plant, Cyanea remyi, is one of the 105 extremely rare Hawaiian plant species on the Red List with less than 50 mature individuals. The Alula, Brighamia insignis, has been moved from Critically Endangered to Critically Endangered (Possibly Extinct in the Wild), and is one of 38 Red Listed species with fewer than five individuals remaining. The Alula has been so harmed by invasive species and landslides, that only one plant remained in the wild in 2014 and it has not been seen since. “Hawaii is an example of nature at its best with spectacular examples of evolution, yet it is facing an uncertain future due to the impact of invasive species, showing how, unwittingly, human actions can make nature turn against itself,” says Matt Keir, a member of the IUCN SSC Hawaiian Plant Specialist Group. “What we see happening in Hawaii is foretelling what will happen in other island or contained ecological systems,” said Keir, urging action to stop the spread of invasive species and to protect species with small population sizes. This new data will be used to influence action such as listing species under the U.S. Endangered Species Act, which will help to secure funding for conservation programs to target and control invasive species, and to fence wild areas to protect them from large mammals. Improved biosecurity to stop invasive species from entering the country is essential, say IUCN experts. This update of The IUCN Red List brings some good news for the Giant Panda and the Tibetan Antelope, demonstrating that conservation action can deliver positive results. Previously listed as Endangered, the Giant Panda, Ailuropoda melanoleuca, is now listed as Vulnerable, as its population has grown due to effective forest protection and reforestation. 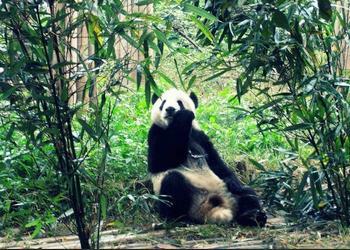 The improved status confirms that the Chinese government’s efforts to conserve this species are effective. Still, climate change is predicted to eliminate more than 35 percent of the Panda’s bamboo habitat in the next 80 years and as a result, the Panda population is projected to decline, reversing the gains made during the last two decades. To protect this species, it is critical that the effective forest protection measures are continued and that emerging threats are addressed. “The Chinese government’s plan to expand existing conservation policy for the species is a positive step and must be strongly supported to ensure its effective implementation,” says the IUCN. Due to successful conservation actions, the Tibetan Antelope, Pantholops hodgsonii, has been moved from a listing as Endangered to Near Threatened. The population underwent a severe decline from around one million to an estimated 65,000-72,500 in the 1980s and early 1990s. This was the result of commercial poaching for the valuable underfur, called shahtoosh, which is used to make shawls. It takes three to five hides to make a single shawl, and as the wool cannot be sheared or combed, the animals are killed. Rigorous protection has been enforced since then, and the population is currently likely to be between 100,000 and 150,000. Other conservation successes include the Greater Stick-nest Rat, Leporillus conditor, endemic to Australia, which has improved status, moving from Vulnerable to Near Threatened. This is due to a successful species recovery plan, which has involved reintroductions and introductions to predator-free areas. This unique nest-building rodent is the last of its kind, with its smaller relative the Lesser Stick-nest Rat, Leporillus apicalis, having died out in the 20th Century. The resin created by the rats to build their nests is so strong that they can last for thousands of years if they are not exposed to water. The Bridled Nailtail Wallaby, Onychogalea fraenata, has also improved in status, having been moved from Endangered to Vulnerable. Endemic to Australia, this once common species had a steep population decline during the 19th and early 20th centuries due to the impacts of invasive species and habitat loss. A successful translocation conservation program establishing new populations within protected areas is enabling this species to begin to recover. On Saturday, IUCN, its Species Survival Commission, and nine Red List partner institutions forged a new commitment to support the IUCN Red List. The institutions include: Arizona State University; BirdLife International; Botanic Gardens Conservation International; Conservation International; NatureServe; Royal Botanic Gardens Kew; Sapienza University of Rome; Texas A&M University and the Zoological Society of London. These organizations will jointly commit more than US$10 million over the next five years towards achieving an ambitious strategic plan that aims to double the number of species assessed on the IUCN Red List by the year 2020.